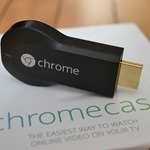 Our friends across the pond will no longer have to resort to importing a Chromecast from the US as of March 19th. That's apparently the day Google's streaming dongle is set to hit shelves in the UK. At least one retailer already has the device in stock and has alerted employees to the impeding launch. According to the screenshot we've been given, the device will be up for sale on Wednesday morning in Dixons retail stores. It's not clear what the price will be, or if Google itself will be selling the Chromecast through the Play Store in the UK as well. It's been a long wait, but you're almost there. Just a few more days until you can stream to your heart's content.